Robjohn brothers, Thomas and William, had both worked as organ builders in England before emigrating to the United States. First sometime in the middle 1830s emigrated the younger brother—Thomas Robjohn (born 24 Sep. 1809 in Tavistock, Devon, England–died 22 July, 1874). Then in 1857 emigrated the elder—William Robjohn (born 14 Feb, 1803, in Tavistock–died 29 April, 1878). Robjohn brothers were very good organ builders and mechanics, either in wood or metal. Thomas Robjohn is a holder of quite a few US patents for musical instruments, ink stands, road rammer, sewing machines tools, etc. 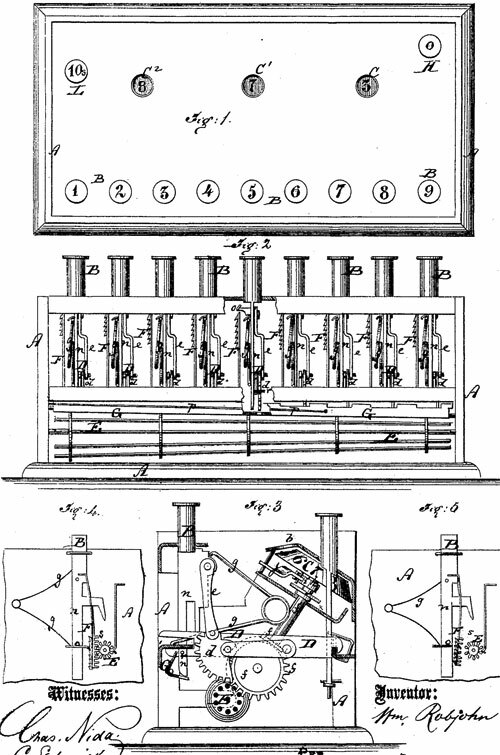 William Robjohn also is a holder of several patents—for pine organs, a liquid meter, and, which is important for us as computer-geeks :-), for a calculating machine of interesting construction (US patent 130244 of 1872). Let's examine the calculating machine of William Robjohn, using the patent application. The machine of William Robjohn is a single digit adding device (i.e. having the capacity for adding but one digital column at a time) and is the first key-driven calculator with a positive control. In the illustration of the patent drawings of the machine can be noted that there are 3 sight openings in the casing through which the registration of the numeral wheels can be read. The numeral wheels are connected by devices for carrying the tens, one operating between units and tens wheel and another between the tens and hundreds wheel. The units wheel, shown in Figure 3, is connected by gearing to a long pin-wheel rotor (marked E), so that any rotation of the rotor will give a like rotation to the units numeral wheel, to which it is entrained by gearing. To each of the 9 digital keys (marked B), is attached an engaging and disengaging sector gear device, which, as shown in Figure 3, although normally not in engagement with the rotor E, will upon depression of its attached key, engage the rotor and turn it. A stop device is supplied for the key action, which in turn was supposed to stop the gear action; that seems rather doubtful. However, an alternative device is shown in Figures 4 and 5, which provides what may without question be called a stop device to prevent over-rotation of the units wheel under direct key action. It will be noted that the engaging and disengaging gear device is here shown in the form of a gear-toothed rack and that the key stem is provided with a projecting arm ending in a downwardly projecting tooth or detent, which may engage the rotor E, and stop it at the end of the downward key action. While the stopping of the rotor shows a control in the machine, which takes place under direct action from the keys to prevent overthrow of the units numeral wheels, it didn't prevent the overflow of the higher or tens wheel, if a carry should take place. There was no provision for a control of the numeral wheels under the action received from the carry of the tens by the transfer mechanism. Almost nothing is known about William Robjohn. He was born in Tavistock, Devon, England, on 14 February, 1803, to Thomas Rohjohn (1772-1835) and had a brother Thomas (1809-1874) and a sister Mary. He had been a foreman for the famous London based organ makers Gray and Davison, before to emigrate with his family in 1857 to New York, USA, at the insistence of his younger brother Thomas, who lived there from middle 1830s and built many organs of his own, supplementing his income working for other New York organ builders. Since 1858 Robjohn brothers worked together and built several organs, characterized by splendid, carved casework, mechanical ingenuity and forward-looking tonal design. 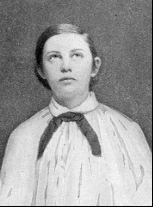 William Robjohn was married to Harriet Robjohn and they had 3 sons: Thomas Robjohn, Frederic Robjohn (1855-1867), and William James Robjohn (1843-1920). William James Robjohn (see the nearby image) became a famous US musician and composer (under the name Caril Florio). William Robjohn died on 29 April, 1878, in New York.